Labor Day, the unofficial end to summer, has come and gone. If you are a parent you are now back to the grind of dealing with the start of the school year for your kids. Like good parents you’ve dealt with the back-to-school shopping and you are now helping your children readjust their schedules so that they get back into the groove of a school year schedule or cope with their new teacher anxiety. As this new school year starts, a good parent will need to add one more thing to their back to school checklist — getting the lead test results from your child’s school drinking water pipes. 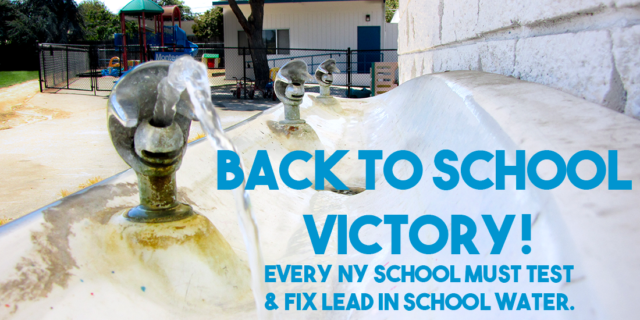 Thanks to the leadership of the New York State Legislature, which passed bills in both houses in June, and Governor Cuomo, who today signed the first in the nation lead in school drinking water testing bill into law, parents across New York State will now know if their child’s school has a problem with lead in the pipes that supply the school’s drinking water. Long-term exposure to lead, a naturally occurring metal used as early as the Roman Empire and now in everything from construction materials to batteries, can cause serious health problems, particularly in young kids. Lead is toxic to everyone, but unborn babies and young children are at the greatest risk for health problems from lead poisoning — their smaller, growing bodies make them more susceptible to absorbing and retaining lead. Lead poisoning is a completely preventable childhood environmental health problem — the solution is to find the lead and remove it from the environments where our children live, play and go to school. Many parents may know about peeling paint as a source of lead exposure for their children, and it is and still remains the largest source of childhood exposure to lead. But after what happened in Flint, Michigan, all parents should be aware that lead exposure can also come from the water flowing through old lead pipes and faucets or from the lead solder that connects the pipes. This is particularly important for low-income families of color in NYC, since we know that these families are more likely to live in older, poor housing stock. None of this is what you send your child to school for and most parents are probably surprised to learn that about 90% of our schools in the country are not required to test for lead in the school drinking water.The new New York State law and the accompanying regulations requires all school districts in New York State to test potable water for lead contamination, and to develop and implement a lead remediation plan where necessary and notify the parents of children in the school. The law was developed by a coalition of advocates that included WE ACT for Environmental Justice, the New York League of Conservation Voters, Clean and Healthy New York, NYPIRG and Healthy Schools Network. With Governor Cuomo’s leadership the Empire State is taking one more step toward making the schools in our state the safest place for all children to be. So as the new school year gets started don’t forget to check to see if your child’s school has been tested the results should be available in December.